Unveil the mysteries of primeval legends, encounter ancient creatures from a time before time, and prepare to enter a preternatural world where nothing is permanent and everything is alive and vibrant. 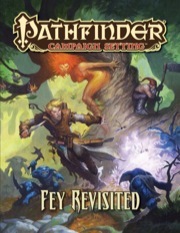 Now the Pathfinder Roleplaying Game explores 10 of the Golarion’s most iconic and well-loved fey creatures in Pathfinder Campaign Setting: Fey Revisited! With Fey Revisited, you can immerse your game in the rich lore of legendary beings such as vigilant tree-bonded dryads, fanciful goat-legged satyrs, and blindingly beautiful nymphs, or release lurking evils like sadistic redcaps and diverse hordes of maniacal gremlins. Each entry includes how these embodiments of nature might guard or corrupt the world, details on the unique tokens they bestow upon favored mortals, and a ready-to-use threat or ally of each fey race. Dryads, guardians of the forest who ensnare mortals’ minds for their own goals of preservation. Leprechauns, folkloric pranksters rumored to hide great riches available to those who find their stash. Norns, the powerful beings said to pull at the threads of fate. Nymphs, stunningly beautiful fey who strike blind those who peer upon them. Redcaps, blasphemous and sadistic murderers known for dipping their woolly caps into the blood of their victims. Satyrs, creatures of whimsy and strength who use their musical pipes to haunt and bewilder. Other capricious creatures, such as a handful of types of pesky gremlins, terrifying nuckelavees, elusive rusalkas, and playful and quirky sprites. 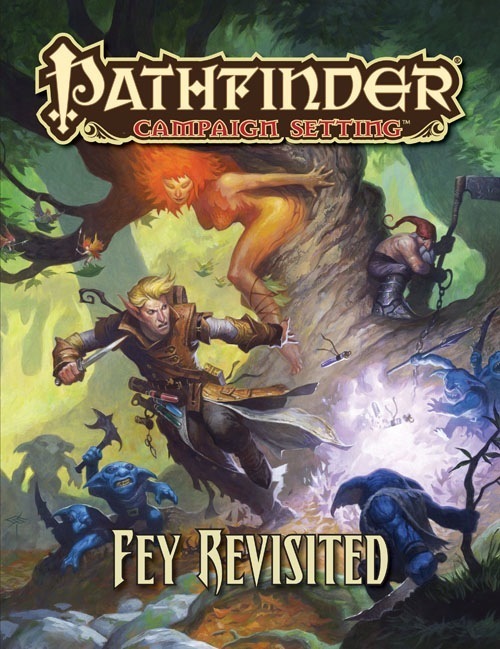 Fey Revisited is intended for use with the Pathfinder Roleplaying Game and Pathfinder Campaign Setting, but can easily be used in any fantasy game setting. I get the feeling the writers weren't terribly inspired by the fey, because there's nothing really interesting here you couldn't learn on wikipedia. No real striking culture features, no talking about fate and what it means to be fey. I feel they missed some key opportunities to explore high concept ideas like, "do fey have souls?" by just going with straight myth, and not challenging the idea that maybe it's just bigotry. After all, fey in myth are believed to be linked to old gods of conquered or forgotten people. If that's not a rollicking loaded gun of ideas for major spiritual conflict/politics along side the entire fey court concept (which is just vaguely mentioned), I don't know what is. The things that did work for the book were Gremlins, which seem to have been given more thought and flavor than the other fey. Also the character blocks at the end had more flavor than the rest of the sections. I think this might have worked better as an unleashed product, due to the fact some of the types of fey used are very well known (dryad, nymph). While I’ve generally considered all of the Revisited books to be excellent resources (particularly for games that heavily feature creatures from a particular Revisited book), the most recent one, Fey Revisited, is something of a disappointment. As the title suggests, this book focuses on ten kinds of fey. The book is designed and formatted in much the same style as previous Revisited books, but what’s lacking here is content. Sure, there are just as many creatures examined in the same number of pages, but whereas the previous books always provided new insight into their selected monsters, I came away from this book feeling like I hadn’t really learnt much new about the fey within. Most of them still seem somewhat nondescript, even characterless. On top of that, the book misses the opportunity to make clear distinctions between some of the very similar kinds of fey it examines. As a campaign setting, you usually dont expect much for players, certainly not traits, which are almost always in the primers or player companions for a subject. But you do often see some new feats or items or subdomains that can filter down, and this did not have them. I am still giving it 4 stars because it is a campaign setting and didnt promose them - Im just used to getting a few from others in the Settings Series. That said, the actual content exceeded expectations! Firstly, there were WAY more Fey listed than I expected. Sprite dryad nymph leprachaun, i figured those. But there were many more! Very nice surprise. Secondly, all those additional ones i mentioned are drawn from classic mythology (be it greek, norse, etc) and they not only readily admit it, but help you track down other sources that might add flavor - very cool! No weird stuff pulled out of this air here - these all have 'real world' connections and hence all kinds of wikis or classic lit books you could use as additional material. Best of all, this product has THE BEST art i have seen in a settings edition yet, both in quantity and quality. Whoever is in charge of the layout of this product needs a raise. The writing is top notch, but its the design that pushes it from 3-star functional to 4-star impressive! Fairly strong recommend if you are a GM (not player) that has any interest at all in this subject matter. It is a pure lore book tho ( a darn good one), so don't be surprised that there arent new feats and subdomains. New tokens? I wonder what those are. Neat I like the cover despite being a mock cover. But March is way to long to wait... I want it now! This will be a good one. I'm especially curious about the chapter on satyrs. Anyone want to bet that the art for it will show a satyr trying to seduce Seoni or Alahazra? Of course, for the true puckish spirit of the fey, they'd show the satyr courting that female half-orc inquisitor. Can't wait for this one, I have been waiting for a fey revisited book for since the first revisited book. Tokens that fey can grant, this sounds interesting. We so need a picture of this in the book. This may or may not be the finalized list though. THe others on the list are all cool tho! Excellent. Next summer I'll be rekindling my Darkmoon Vale campaign, which features some quite heavy fey influence, and this will be really useful. Yay! Maybe we will finally get the fey version of polymorph spells. Regardless, I'm eager to see (and use) this material in a future adventure or campaign. Very cool. Ray! Tim! And The New Girls! I was about to ask "Where the frak is Neil" but I have the answer. At some point, and in some product, I'd like to see some information on the First World too. Maybe a Fey Player Companion and Chronicle duo when they do my wishlist First World/Fey AP? I would also like more info on the first world, this one and maybe one day a campaign setting/gazetteer book for the first world itself. That's the great thing about the revisited line though: making boring, cliched critters interesting again. Which pretty much the entire lineup of fey could use. They're generally either pms tinkerbells or, worse, emo/goth stand-ins impossible to differentiate from vamps. I hope for a breath of fresh air, and I look forward to what this means for the Reign of Winter campaign. Hopefully these fey will be taking nods from eastern and central european myth. Azazyll, the same thing could be said for undead wich have only three flavores, spirit, soup bone, and fleshy. I for one really like everything on the list except for the Nuckalavee, really wish they had Nixie(my favorite) and/or Pixie over the Sprite. So, gremlins are just one entry? I wonder what exactly that will cover. The dreaded pugwampis, I'm sure. It will cover all of the ones to date and maybe just maybe we will get a new type of Gremlin but more then likely it will be a gremlin with class levels. This will be perfect, that should be when my Kingmaker game will begin YAAAAAAAY. Well more often then not the product comes out near the end of the month but at least it will be the same month and Saint Patricks day. Uh oh. I'm seeing trouble coming soon in Space and/or the Hood. Very cool, looking forward to this one. Won't get much out of the Nuckalavee or Norn, and Pixies would've been more iconic, but cool list! Bought. The Norn would still be interesting but yes Pixies are more iconic so I thought for sure they would make the list. Though there is a chance that this list is not the final version they will use so who knows. Seconded these little buggers need so much more coverage. MMCJawa, You would think that Pixies(Nixies, Atomies, Grigs, etc.) would be classified as sprites as it was in 2nd and 3.0/3.5 edition but Pathfinder never did, so who knows. There's a possibility that Mites might get a bit of love in the Gremlin chapter since they're seen as related Fey. Norns make sense because they usually try to cover a range of CRs with these books and, currently, there just aren't that many high-CR Fey. Norns fit the bill pretty well. Yeah I agree that Mites will at least get some mention in the Gremlins section. People like mites and hate nuckalevee, strange world we live in. I never cared for Mites, ettercap (vermin control) + Gremlin + Goblin (weakest link creature) does it all for me, so wouldn't mind if they aren't there, Vexgit (the technical destroyers) and Jinkin (cursed) gremlins are my favorites, but i'm sure al gremlins get a mention in there. A little less then six months to go and so we got a while to wait. It would be interesting to find out about mites and why gremlins hate there former kin. I really wanted to have Pixies and Nixies for this one but since so far Paizo hasn't done a sequal book to the revisited line it is doubtful I will. Their probably won't be a Fey revisited 2, but there could very well be a "denizens of the First World revisited" or a Forest dwellers revisited, etc. Yeah, it is a possibility that we might get a revisited book with fey in it if it fits the "theme" they are using. Probably because they are useless, weak, copycats of the much cooler ettercap?